OhMyVera! A blog about all things Vera Bradley: Trip to St. Louis for the Nerium Get Real Convention! Trip to St. Louis for the Nerium Get Real Convention! Last week I flew to St. Louis to spend four amazing days at the Nerium Get Real 2014 Convention! Last time I flew to St. Louis my luggage got lost, so this time I made sure to carry on my luggage. I packed up my Boysenberry 22" spinner and a plain backpack. I got so many compliments on my suitcase this trip! It sure does stand out! I also knew that I would be coming up with some additional items, so I packed a Small Duffel in English Rose in my bag. It worked out great! I packed the extra stuff in the small duffel and used that as my carry on bag for the way home and checked my suitcase. I figured better to loose your suitcase on the way home than on your way to vacation! And it didn't get lost, so that was awesome! All packed up and waiting for my flight! So many Vera Sightings! This is only a fraction of them! We took a little time to be tourists. We went to the arch and to the Budweiser brewery tour, along with some other local spots. The most exciting part of the convention was the announcement of our new product: NeriumFirm A scientific breakthrough holds the answers to looking toned and smooth all year long. Following the historical success of the NeriumAD age-defying skincare line, Nerium International presents NeriumFirm Body Contouring Cream! 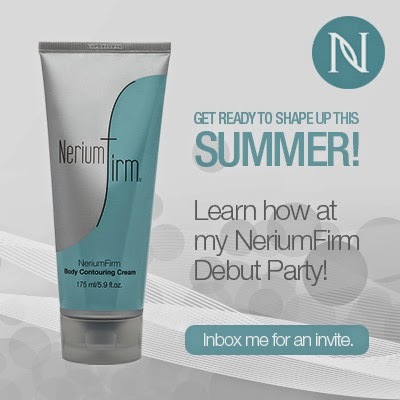 NeriumFirm is a skin-tightening cream developed from the patented NAE-8 extract of the Nerium oleander plant. Its powerful antioxidant formulation has been clinically proven to reduce the appearance of cellulite and dimpling and to help smooth, tighten and firm the appearance of loose skin. NeriumFirm also helps restore the appearance of youthful contour, tone and texture. Preferred Customer $70.00 a tube Click here to purchase now! Or email me at ohmyvera@gmail.com And for more Nerium news follow me on Facebook: https://www.facebook.com/aglabe.nerium PS. Nerium International is expanding into Canada! If you are Canadian and interested in bring a Brand Partner, send me an email! Where are all my Canadian readers at?!?! Love you all!